Heat oven to 350°F. Place paper baking cup in each of 18 regular-size muffin cups. In large bowl, stir brownie mix, oil, water, vanilla, cayenne and eggs 50 strokes with spoon. Divide batter evenly among cups. In small bowl, mix 2 teaspoons of the cinnamon and granulated sugar. Sprinkle evenly over batter in cups. Bake 17 to 23 minutes or until toothpick inserted in center comes out clean. Cool 5 minutes; remove from pans to cooling racks. Cool completely, about 30 minutes. In large bowl, beat butter, 1/2 cup of the caramel syrup and remaining 1/2 teaspoon cinnamon with electric mixer on medium speed until well blended. Beat in powdered sugar until smooth. *For softer frosting, add whipping cream 1 tablespoon at a time for desired spreading consistency. 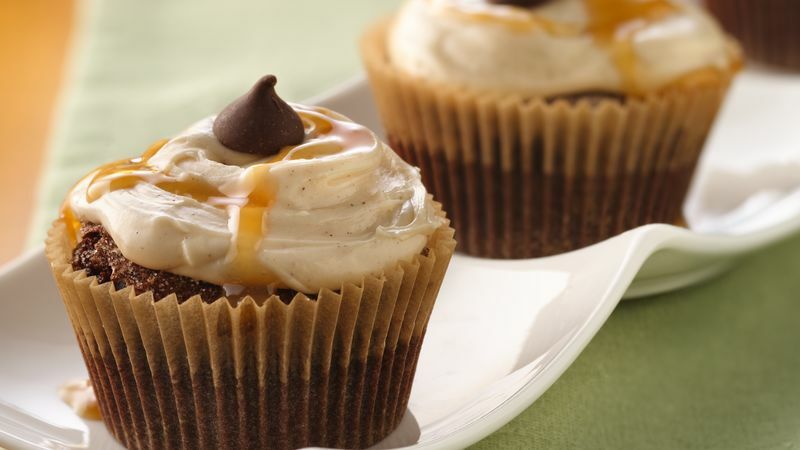 Frost cupcakes; drizzle each with scant teaspoon caramel syrup. Top each cupcake with 1 milk chocolate candy. Store covered in refrigerator.